Put the first 8 ingredients in a small pan over medium heat. Bring to a boil, and simmer for 30 minutes. Add some water if it dries out before the 30 minutes are up. Add 1/2-1 cup almond milk, depending on the consistency you like. Add the chia and stir. Sprinkle with coconut flakes, and sweeten with honey to taste. Wait at least 5-10 minutes for the chia to absorb some liquid, and then serve mixed with a few blueberries. Keep this pudding refrigerated, and eat it cold; or heat again before eating. You can use the same recipe with rice or quinoa instead. 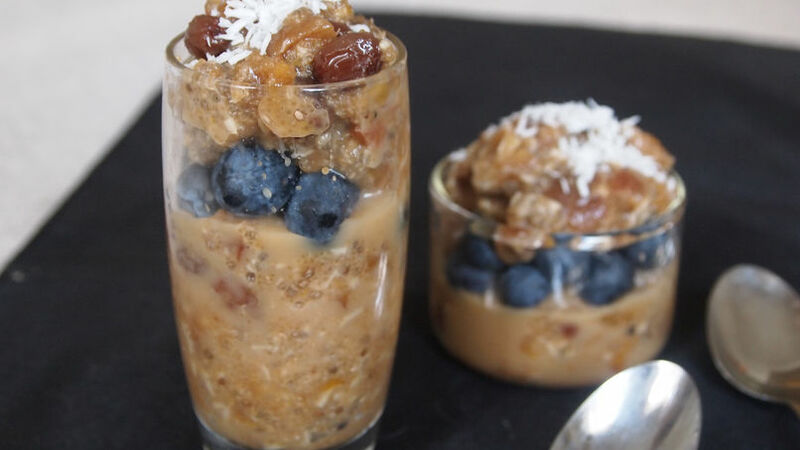 Add any dried or fresh fruit of your choice to this pudding. Despite not being Latin in origin, rice pudding is one of the most staple Latin American dishes. The popularity of this easy dessert probably lies in its delicious and comforting creaminess and sweetness, combined with the simplicity and affordability of making it. A few months ago, my mom and I decided to start playing around with other ingredients, and used amaranth instead of rice. This seed has a sticky texture when cooked, which makes it perfect to give a pudding consistency to this dessert. I used ground chia seeds to enhance the texture even more, and almond milk to make it vegan. Check out the recipe to taste the results!